Congolese musician Babia Ndonga “Chokoro” who is mostly known for his role as a lead vocalist in Koffi Olomide’s Quartier Latin passed away on 2014. Babia sung in Quartier Latin when that band was at the very peak of its powers in the early 1990s.During this time he perfomed vocals along with other Quartier Latin stalwarts like Modogo Abarambwa, Eric Tutsi, Lebou Kabuya and Sam Tshintu. His greatest effort was in the song “Amen” which he composed and sung along with Koffi Olomide. His melodious piercing voice is quite possibly one of the best voices heard in Congolese music recently. Koffi Olomide himself even admitted that Babia was the best vocalist he ever had. He left Quartier Latin in the mid 2001 and his life took a turn for the worst due to a drug problem that led to his arrest but also effectively ruined his music career. Before Fally Ipupa started to sing with Koffi, Babia was seen as one of the most promising musicians in Congolese music. He did return to Quartier Latin in 2003 but was rarely deployed by Koffi. He left again in 2011. On Wednesday October 8 2014, Babia apparently had an argument with his wife. During the argument he collapased , was rushed to hospital and pronounced dead on arrival. He died of a stroke in Luanda, Angola where he had been living for a year while earning a living playing outdoor concerts. He was preparing his first solo album. After his death, several musicians came forward to pay tribute to him especially his former band-mates including, Sam Tshintu, Koffi and Modogo. However Koffi has come in for harsh criticism for having treated Babia badly when he was alive. After Babia’s death, Koffi Olomide volunteered to pay to transport Babia’s body from Luanda to Kinshasa for burial. He also promised to produce and release the album that Babia had been working on. But Koffi faced accusations of hypocrisy from Congolese musicians, journalists and the public. 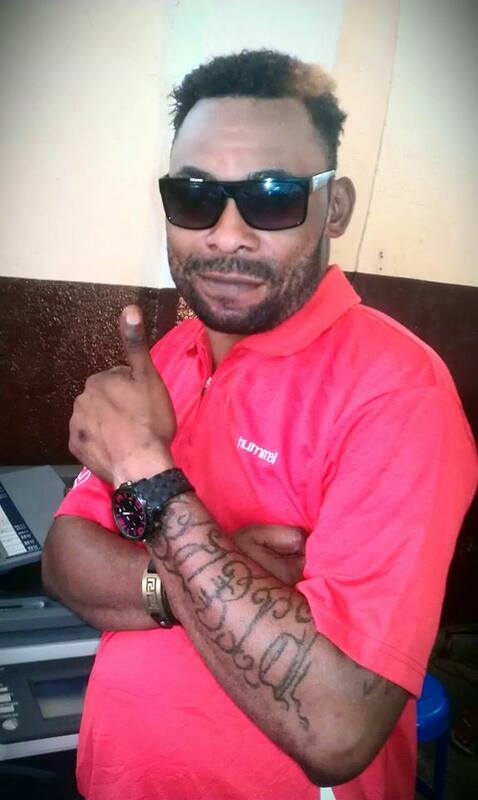 They said he had treated Babia shabbily when he was alive among other things, they said Babia had been a loyal Quartier Latin member and even stayed when many other defected to form their own band (Quartier Latin Academia). Yet Koffi treated him poorly by not letting him participate in albums. He even deleted Babia’s lyrics from the 2008 album, Bord Ezanga Kombo. Some accused him of never taking Babia on tours to Europe. But that was likely because of Babia’s drug problems. The public further said that when Babia returned to Quartier Latin, Koffi treated him not as a senior but as a junior band member known as Les mineurs, thus causing Babia to become a laughing stock. In this song, Babia is crying out “Lord why have you forsaken me” As Jesus did on Mt Golgotha. This entry was posted in Africa Music News and tagged Babia Ndonga, Koffi Olomide, Koffi Olomide & Quartier Latin. Bookmark the permalink.